When former British Prime Minister Margaret Thatcher died today, almost every headline noted she was called the “Iron Lady,” a moniker received from her adversaries in the Soviet Union because of her toughness in dealing with them. Most women probably would have been insulted by such a nickname, but instead Thatcher embraced it, using it to enhance her reputation as a powerful leader. 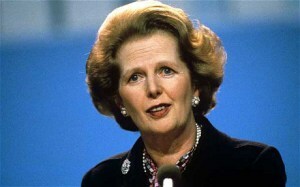 Thatcher knew the “Iron Lady” persona was a great tool for getting her message out. She capitalized on Marshall McLuhan’s famous observation “the medium is the message”– any decision by an “Iron Lady” would have to be rock solid, right? Thatcher showed that an easy-to-grasp identifier can do wonders towards helping you succeed in the media. I noticed a similar example at this year’s “South by Southwest” tech gathering in Austin. I watched a TV segment with Brit Morin of Brit + Co. who calls herself the “Martha Stewart of Silicon Valley.” But what was fascinating was the newsperson interviewing her and the lower-third identifying her on the screen also called her that. I was with my wife and asked, “Who SAYS she’s the Martha Stewart of Silicon Valley? She does! !” And if you do a Google search, you’ll find that showing up as well. So everyone is buying into the persona Brit has created for herself. Plus, she has not only come up with a memorable title, she is piggy-backing on another famous person who has her own well-known persona– making this a doubly-brilliant move! You can’t do any better than that. Now, you don’t need to be known by anything nearly as original or clever as Thatcher or Morin, but to really stand out in the media you DO need to be memorable in some way…and that means having a strong position on whatever your message is. Think about those who are big media successes– there is nothing wishy-washy about them…you know exactly what they stand for. And that’s how you want to be perceived, too. Margaret Thatcher once said, “Standing in the middle of the road is very dangerous. You get knocked down by traffic from both sides. So, take a tip from the “Iron Lady” and make sure whatever message you are trying to deliver is clear, unambiguous and memorable. You will get noticed.